The Lantana All Weather Wicker Dining Collection brings you beauty and style with the substance everyone needs in a dining set. This exclusive set to Open Air Lifestyles definitely has that "WoW" factor in person. Complete with a protective tempered glass top, this all weather wicker set will withstand all the elements. This outdoor furniture set is woven over top of an aluminum frame, complete with reinforced joints for durability for many years to come. 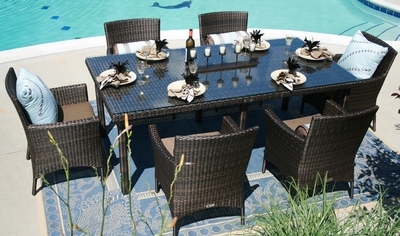 This outdoor dining set is made with Viro Prussian Dark Bronze wicker with Sunbrella fabric Canvas Cocoa cushions.